The WGSW-24040HP series can be configured to monitor connected PD (Powered Device) status in real-time via ping action. Once the PD stops working and responding, the WGSW-24040HP series will resume the PoE port power and bring the PD back to work. It will greatly enhance the network reliability through the PoE port resetting the PD’s power source and reducing administrator management burden. Under the trend of energy saving worldwide and contributing to environmental protection, the WGSW-24040HP series can effectively control the power supply besides its capability of giving high watts power. The “PoE schedule” function helps you to enable or disable PoE power feeding for each PoE port during specified time intervals and it is a powerful function to help SMB or enterprises save power and money. The WGSW-24040HP series brings an ideal, secure surveillance system at a lower total cost. 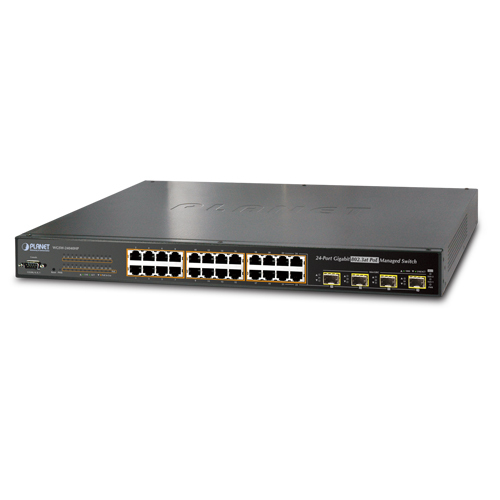 It provides 24 10/100/1000Mbps 802.3at PoE ports with 4-port Gigabit TP/SFP Combo interfaces, offering sufficient PoE power for a maximum of 24 IEEE 802.3af PoE IP cameras at the same time. With 4-port Gigabit TP/SFP Combo interfaces, the WGSW-24040HP series supports connection to three 8-Channel NVR systems to receive stream from 20 cameras and also to backbone switch from an uplink port, and then access to control center. With its high performance switch architecture, the recorded video files from the 20 IEEE 802.3af PoE IP camera devices can be saved in the NVR systems, which can be controlled and monitored both in the local LAN and the remote site via Internet. As the business expands, the additional telephones required could be installed at less cost via the implementation of PoE IP telephony system than that of the traditional circuit wiring telephony system. The WGSW-24040HP series helps enterprises to efficiently create an integrated data, voice, and powered VoIP network. PLANET IEEE 802.3af compliant IP phones can be installed without any power cable because it can be powered via the standard Ethernet cable from the connected WGSW-24040HP series. With the WGSW-24040HP series, IP telephony deployment becomes more reliable and cost effective, which helps enterprises save tremendous cost when upgrading from the traditional telephony system to IP telephony communications infrastructure. Providing up to 24 PoE, in-line power interfaces or providing up to 20 PoE, in-line power interfaces and 4 gigabit TP/SFP combo interfaces, the WGSW-24040HP series can easily build a power centrally controlled IP phone system, IP camera system, or wireless AP group for the enterprises. For instance, IP cameras or wireless APs can be easily installed in the company for surveillance demands or building a wireless roaming environment in the office. Without the power socket limitation, the WGSW-24040HP series makes the deployment of IP cameras or wireless LAN AP easier and more efficient. The 4 gigabit TP/SFP combo interfaces in the WGSW-24040HP series also offers flexible Gigabit TP or fiber connection for uplink to public server groups. PoE Power Budget WGSW-24040HP: 220 watts max.